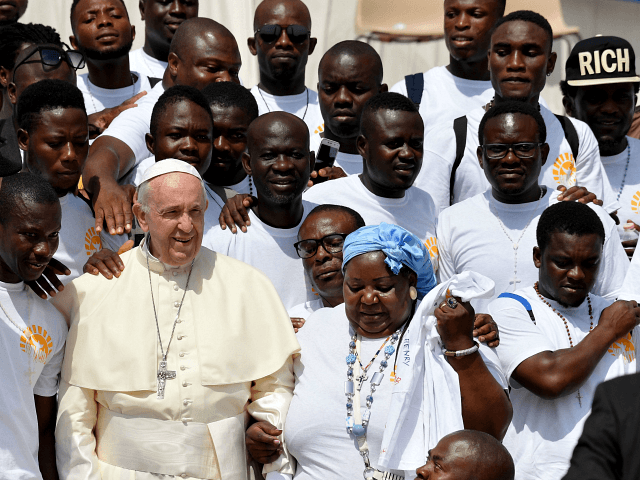 The Vatican department for migrants and refugees has published the collected teachings of Pope Francis on the issue of immigration, reiterating the pontiff’s appeal for a greater openness to migrants. The massive 488-page tome, titled Lights on the Ways of Hope: Pope Francis Teaching on Migrants, Refugees and Human Trafficking, gathers together the pope’s addresses on immigration, underscoring how central this topic has been to his six-year pontificate. “We often hear it said that, with respect to relativism and the flaws of our present world, the situation of migrants, for example, is a lesser issue,” Francis wrote in his 2018 apostolic exhortation bearing the Latin title Gaudete et Exsultate (“Rejoice and Be Glad”). “Some Catholics consider it a secondary issue compared to the ‘grave’ bioethical questions,” he said, a position that he finds untenable. “That a politician looking for votes might say such a thing is understandable, but not a Christian, for whom the only proper attitude is to stand in the shoes of those brothers and sisters of ours who risk their lives to offer a future to their children,” he continued. The pontiff has defended his continual insistence on the issue of immigration by saying it is not just his pet cause but a central teaching of the bible. “This is not a notion invented by some Pope, or a momentary fad. In today’s world too, we are called to follow the path of spiritual wisdom proposed by the prophet Isaiah to show what is pleasing to God,” he said. Throughout his pontificate, Pope Francis has sought to bring about a sea change in debates surrounding migration, appealing for a “change in mindset” and insisting that migrants are not a threat to society but, rather, a source of enrichment. In various addresses gathered in the new Vatican collection, Pope Francis connected mass migration to climate change, said that resistance to mass migration comes from an “innate fear of the foreigner,” claimed that nations are built by migrants, and insisted that the rights of migrants trump national security concerns.